SHARE is delighted to co-oganise the forthcoming SHARE Regional Conference on Qualifications Frameworks and Quality Assurance "Preparing for the Future: The Role of ASEAN (Higher) Education Frameworks in a Disruptive World" with the Office of the Higher Education Commission (OHEC), Thailand and the SEMAEO Regional Centre for Higher Education and Development (SEAMEO RIHED). It will take place on 29-31 October 2018 in Bangkok, Thailand. This exciting event is part of a series of events organised under the EU Support to Higher Education in the ASEAN Region, or SHARE, a project of ASEAN and the European Union, designed to support the development of regional higher education systems and frameworks. 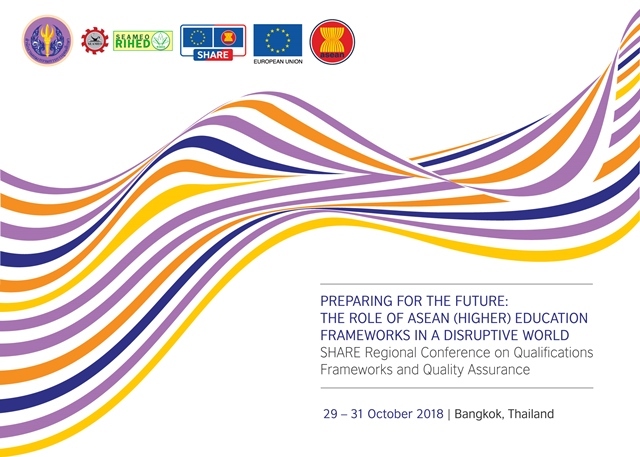 The event is foreseen as the concluding conference for the Result Areas 2a (QF) and 2b (QA) under SHARE, bringing together relevant ASEAN and European stakeholders from the field of QF and QA. The participants will be contacted directly by SHARE and SEAMEO RIHED. More information about this conference will be available soon. © 2017 SHARE EU ASEAN. All rights reserved.